You know you are going to have a fun interesting time blocking something when you have to do a pre block check. What do I mean by that? Well generally I can eyeball how many blocking mats and space that will be required to block something. I can say, yes this sweater will take 8 mats because it’s for me and requires a bit more room. I have that spacial ability, which comes in handy sometimes. Though I admit driving with very little wiggle room still scared the living daylights out of me, but I digress. So for the most part. There is no need to plan my blocking, I just allocate some time and then just do it. Leaves of grass proved to be slightly challenging in the way that on the needles it didn’t seem that big. Off the needles however you see just how massive it could be. Which the amount of blocking space I would need was unclear. So I did a pre-blocking check to see how many blocking mats I would need to block it and so I could make sure I out it in a place where I could block it and that it would finish blocking quickly. With the area cleared, I proceeded to soak the big bit of knitting. 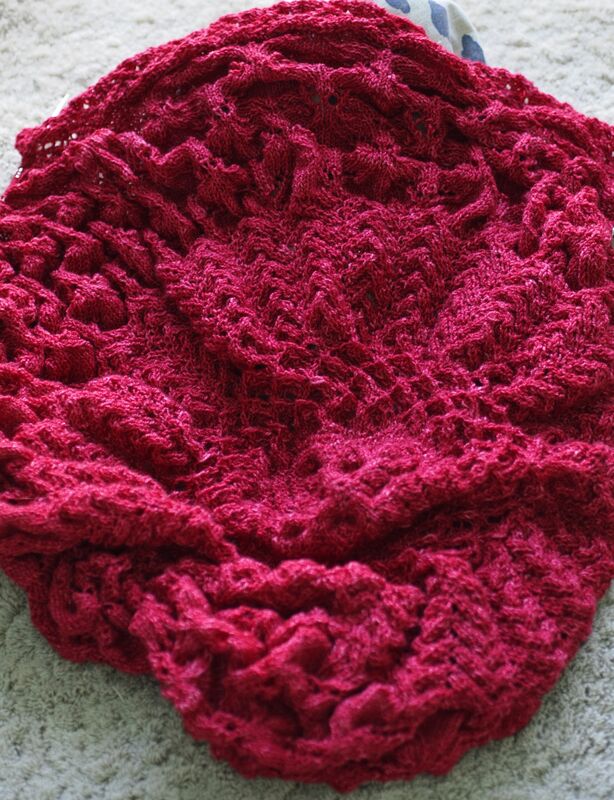 I pinned out all of the tips of the shawl, trying to make sure not to make the circle an oval. Which you would be surprised to find out how hard that can be. After a bit of time, concentration, and sweat (it was hot when I was blocking, which helped), the shawl was dry. I pulled each pin out, hoping that it would stay the way it was…. And sure enough it was perfect. I’m very happy with the result. Just a fair warning school has started for me, so I apologize for the late post. There will be some mini posts hopefully coming soon, once I can get everything going again. As for the pictures of the finished shawl, you’ll just have to come back and see them.